1. Heat milk until it is steaming, not boiling. Immediately remove from heat and stir in 1/4 cup of melted butter. Allow mixture to cool to room temperature. In a large bowl, dissolve the 2 packets of yeast in the warm water with 1 tablespoon of the white sugar. Let stand about 10 minutes. The mixture will look slightly creamy and begin bubbling. 2. When yeast mixture starts bubbling, add the cooled milk mixture. Whisk in the eggs. Stir in the remaining white sugar, nutmeg, and salt. Beat the flour into the milk/egg mixture about one cup at a time. When the dough has pulled together, turn it out onto a lightly floured surface and knead until elastic and smooth. This will take about 10 minutes. 3. Lightly oil a large bowl, place the dough in the bowl and turn to coat with oil. Cover with a damp cloth or plastic wrap and let rise in a warm place until doubled in volume. This will take 2-3 hours. When the kingcake dough has doubled in size, turn out on a lightly floured surface, and punch the dough down to remove air. Divide the dough in half. 1. Mix the cinnamon and brown sugar in a medium-sized bowl. 2. 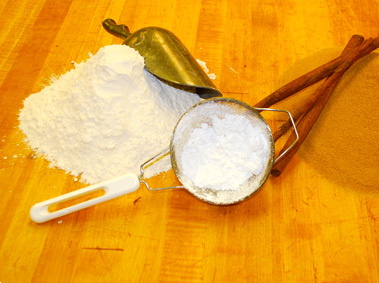 On a floured surface, roll dough halves out into large rectangles (about 10x15 inches). Brush the dough with the melted butter. 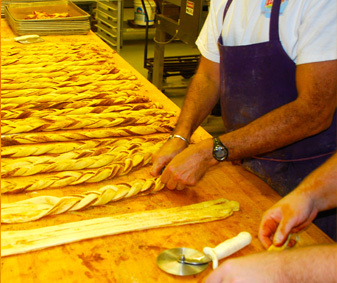 Sprinkle the cinnamon/brown sugar filling evenly over the dough and roll up each half tightly, beginning at the wide side. Bring the ends of each roll together to form 2 oval shaped rings. Place each ring on a prepared cookie sheet. With scissors, make cuts about 1/3 of the way through the rings at 1 inch intervals. Let the king cakes sit and rise in a warm spot until they double in size. This will take about 30-45 minutes. 3. Preheat your oven to 375 degrees F, or 190 degrees C.
4. Bake king cakes in preheated oven for about 25-30 minutes. 1. While the king cake is baking, mix powdered sugar, melted butter, and vanilla extract. Add hot water, one tablespoon at a time, until you reach the desired consistency. 2. When you take the king cake out of the oven, push the small plastic doll into the bottom of the cake. 4. Finish with sprinkles of purple, green, and yellow sugar crystals for a real New Orleans Mardi Gras look. 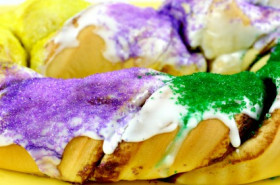 The traditional Kingcake is a soft pastry with a cinnamon sugar filling. It is baked in the shape of a ring. Be careful to not overcook or undercook your King Cake. The top should be golden brown, and the inside should be baked through. The inside should resemble a cinnamon roll. 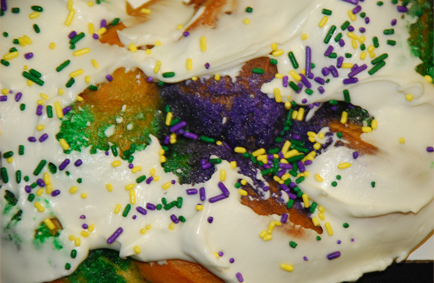 After baking your kingcake, be sure to tuck a small plastic baby or bead underneath the cake, and top it off with purple, green, and gold sugar or sprinkles. Learn more about the Mardi Gras colors. 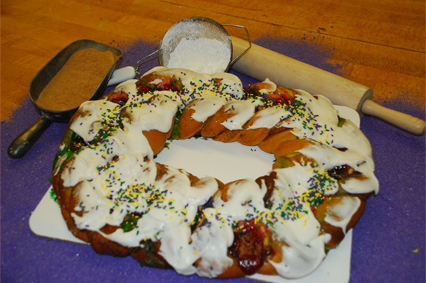 How did you like the Traditional King Cake Recipe? This Kingcake was amazing! 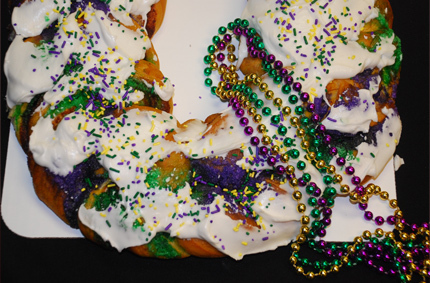 Tastes just like a real New Orleans King Cake. Great job with the recipes. This recipe was delicious. It takes a little bit of time, but it's so worth the wait! I made this cake for a Mardi Gras work party and everyone loved it! I did manage to burn the bottom because I made my slits too deep and the filling overflowed, but the top was fabulous! Nice recipes. I used food coloring to dye my sugar purple, green, and yellow. Just don't forget to spread out the sugar on wax paper or something to let it dry so it won't clump. 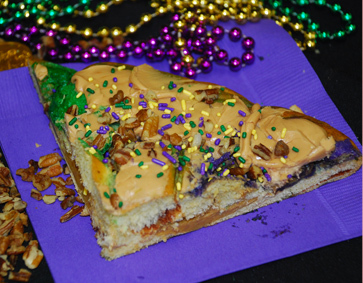 We would really appreciate your feedback on our French king cake recipe. Please use the feedback form to tell us what you think. Scale of 1 (worst) to 10 (best) and please share your comments based on your own personal experiences with our kingcake recipes.